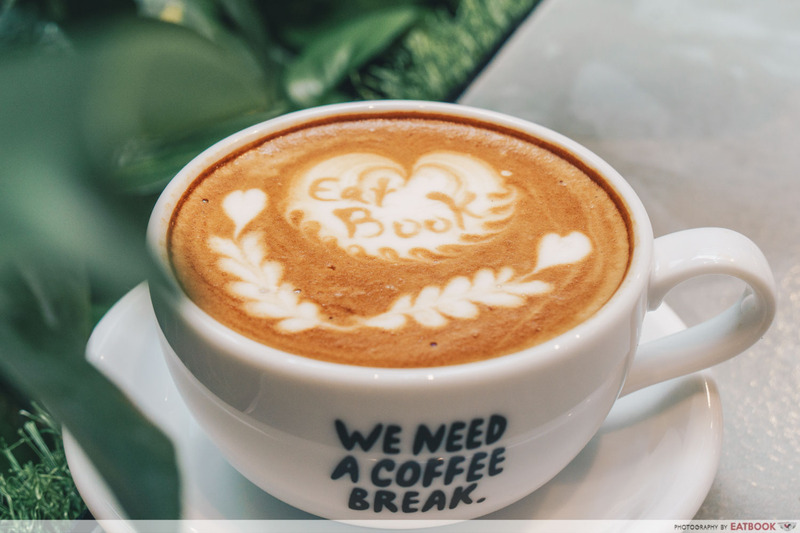 If you’ve been to Hokkaido, chances are someone would have suggested a trip to Baristart Coffee for their kawaii latté art. Yet, less all the gimmick, their philosophy to treat coffee making as art is at the core of their establishment. Hence, the name Baristart. 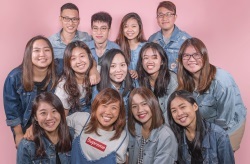 Recently, Baristart set up their first overseas branch in Singapore at Tras Street. 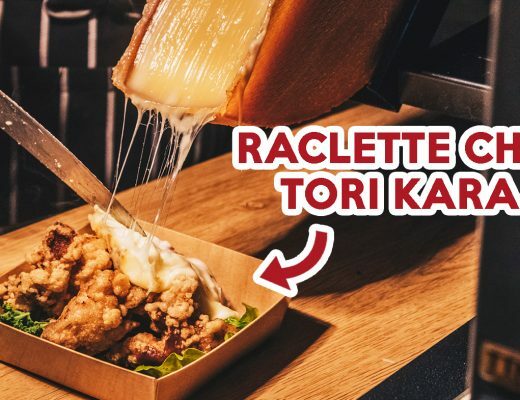 Kurobuta bacon is used to impart lingering smoky notes that give definition to the Hokkaido Carbonara ($17.80++). 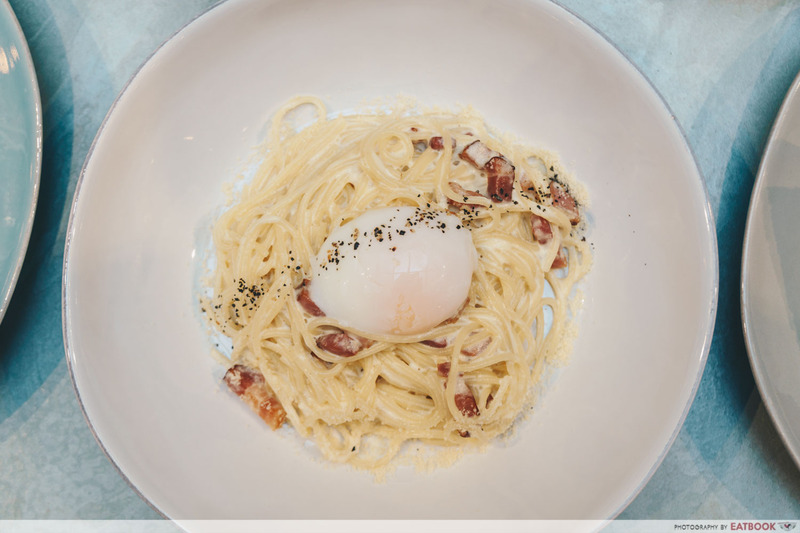 Ground pepper also speckles the pasta, cutting through the heartiness of the carbonara with a piquant kick. 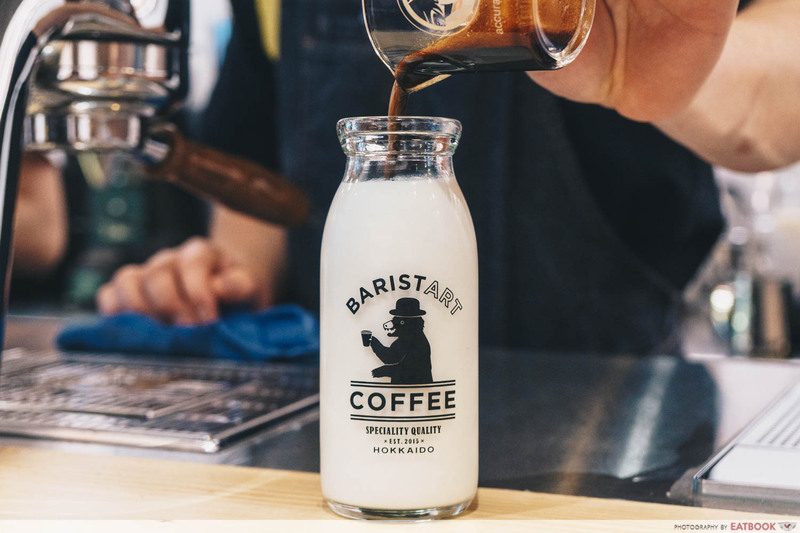 Singapore’s Baristart uses milk from Biei, Hokkaido, which boasts a viscous consistency similar to cream. And there was a sacrilegious amount of Biei cream added to the carbonara. It was as if I was eating pasta doused in milk. 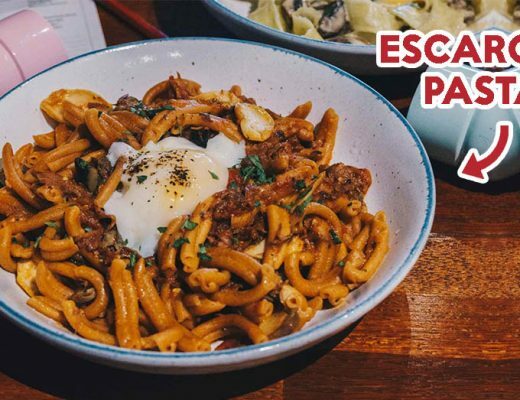 Saturating the pasta further is an onsen egg. 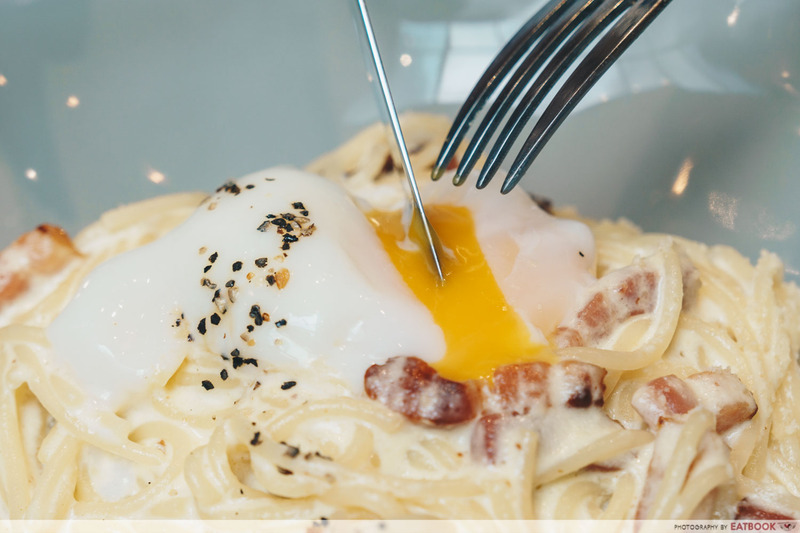 Breaking it floods the spaghetti with a rich, runny yolk that sheens with a luxurious yellow glow. 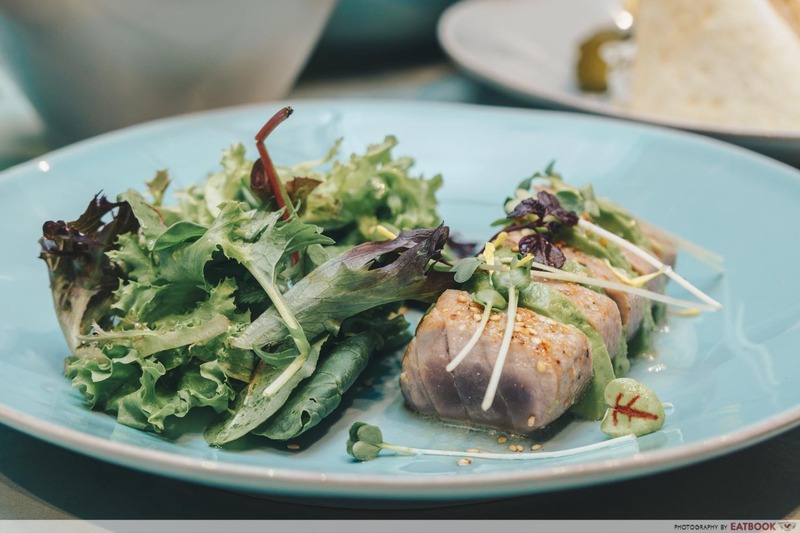 For lovers of fish, the Tuna & Avocado Salad with Wasabi Dressing ($14.80++) is a good bet. 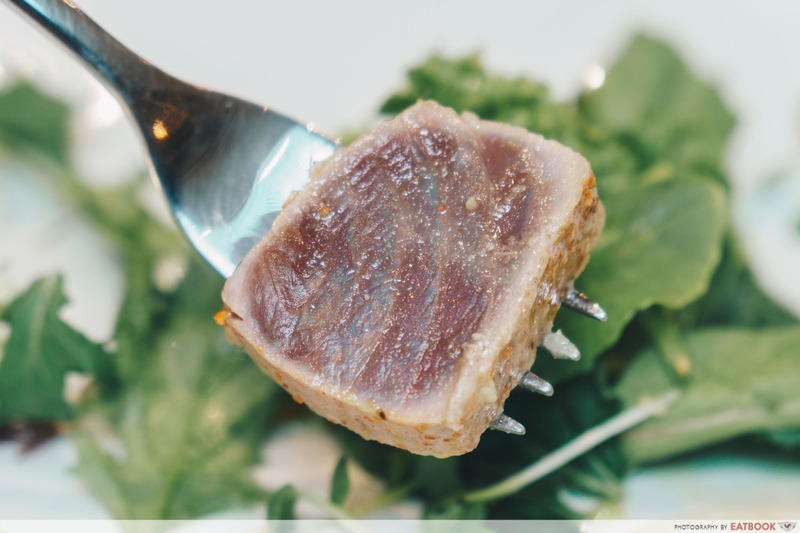 A meaty Maillard crust, formed by a light sear, enveloped the tuna’s dark red flesh. There was just enough heat applied to the fish for its Omega-3 goodness to seep through, bringing out its oceanic flavour. Doubling up to reinforce the Japanese flavours of the dish were the grated wasabi, which gave a tingly heat. 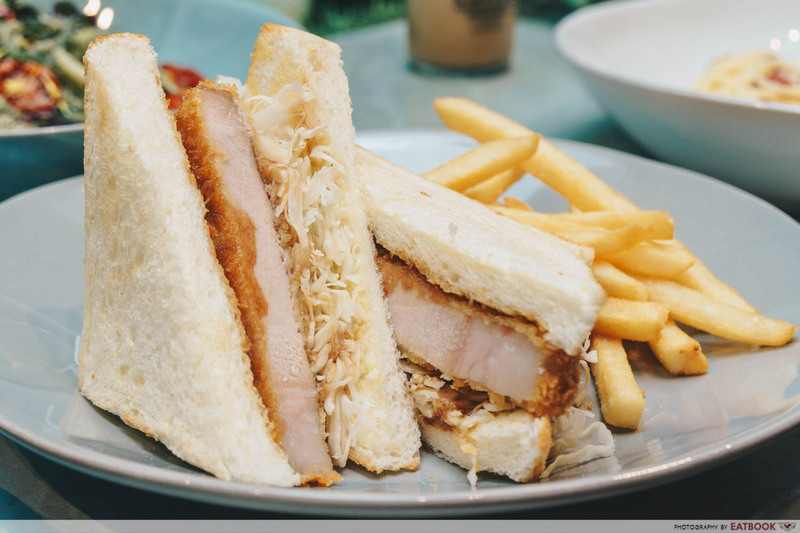 As I looked at the menu, I chanced upon this monstrous dish: the Tonkatsu Sando ($16.80++). 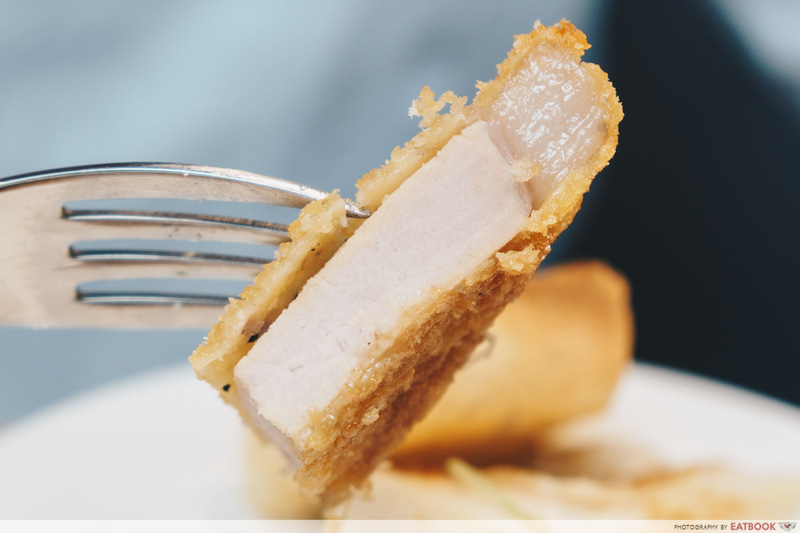 A chunky piece of tonkatsu was sandwiched between lightly toasted white bread. The only vegetable in sight was a heavy cabbage slaw that’s tossed in a sinful concoction of tonkatsu sauce and mustard butter. Cutting through the pork, I was surprised by how lean it looked. Yet, despite appearances, it was juicy and tender. 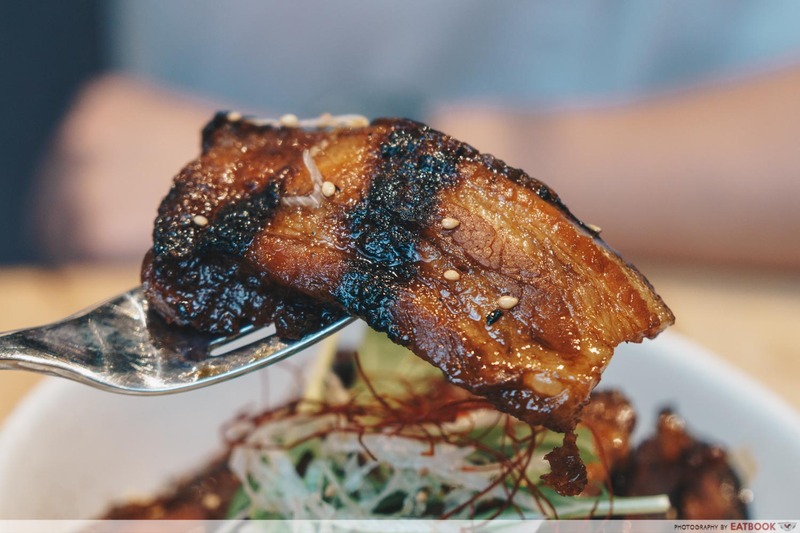 There was also a thin layer of fat, which accentuated the porky flavours of the tonkatsu and gave a distinct contrast to the crispy texture. A bed of rocket and thinly sliced onions rest atop the big bowl of Butadon ($18.90++). I could whiff the tantalising scent of sweet caramelised pork, even as it was being prepared in the kitchen. The buta tasted almost candy-like. 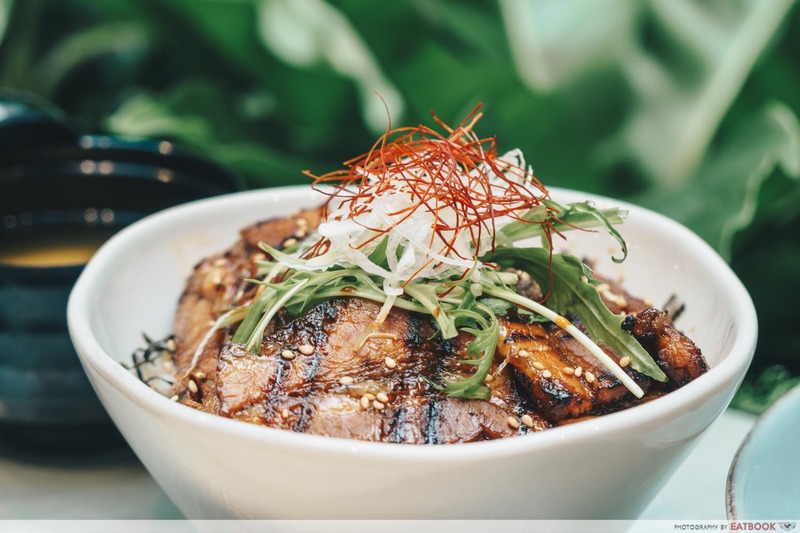 Tender pork is draped in a sweet layer of reduced shio-mirin marinade. What upped the anté were the spikes of char that gave it a satisfying smoky flavour. Tucked under the layers of pork was a large bowl of fluffy short-grain rice. However, I felt that it needed more of that delicious buta marinade to enliven the dish. 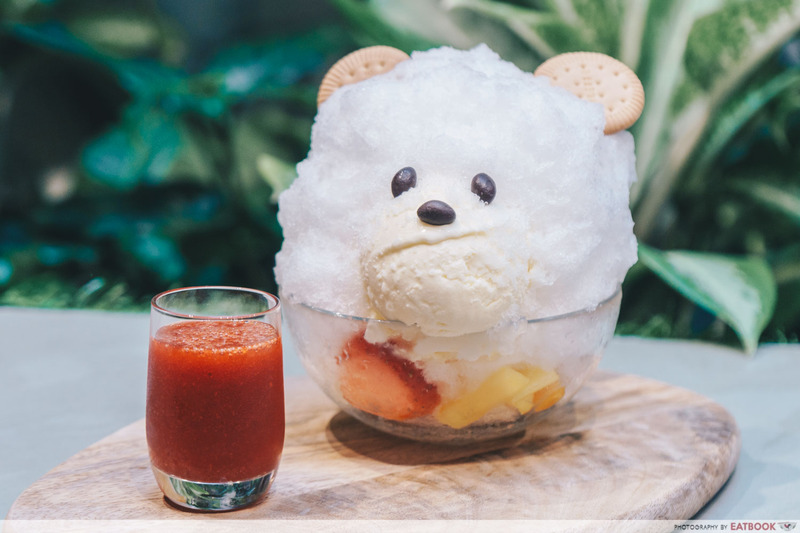 The adorable Shiro Kuma Shaved Ice ($9.80++) is an amalgamation of cut fruits, Biei ice-cream, shaved ice, and a syrup of your liking. Take your pick from coffee, strawberry or green tea syrups. 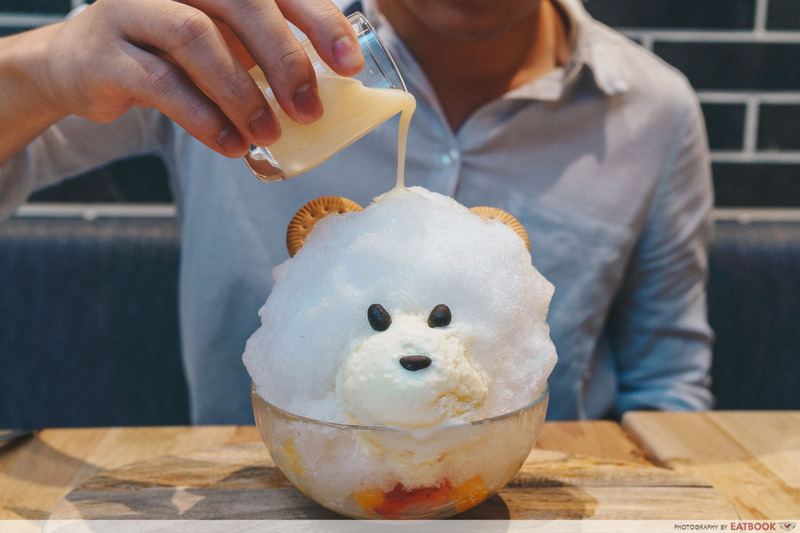 Pouring the syrup over the adorable bear melts the shaved ice and unravels delicately cut fruits. In comparison to the other heavy dishes offered here, this dessert is too light for my liking. The taste of milk and fruits was rather lacklustre. This shaved ice lacked a defining flavour profile, serving as a scaffold for the different flavours to build upon. Moreover, I expected the snow-like texture we enjoy from bingsu. Instead, the dessert was filled with large shards of ice crystals. 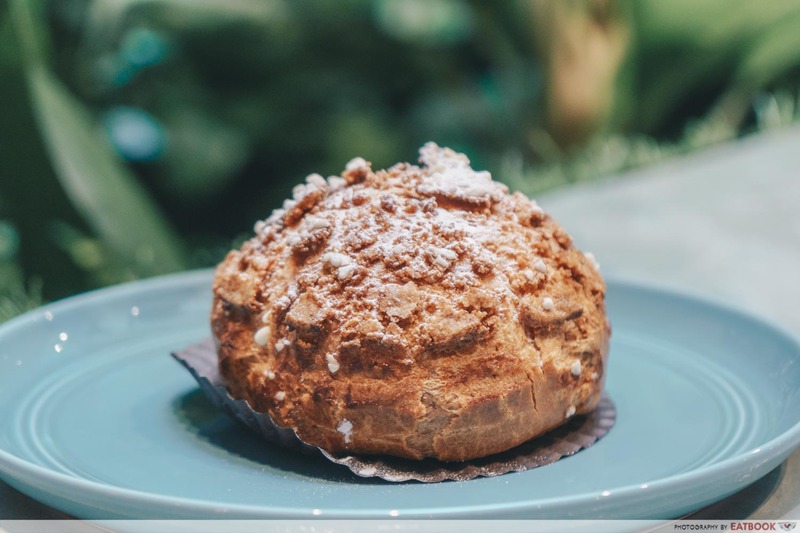 A better choice to cap off your meal is the Cream Puff ($4.50 for one and $12.50 for three pieces) that is larger than your fist. Housed under the choux pastry lurks a creamy Biei custard. 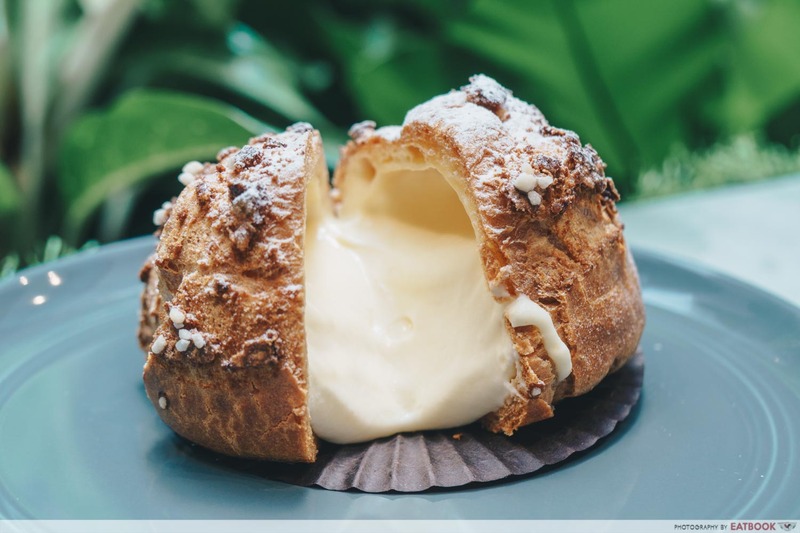 When cut, the puff oozes out custard in a theatrical slow-motion, making it look so irresistible. Engulfing it, I was surprised by the crispy exterior. The crunch of the crust juxtaposed against the soft pillowy interior made for a pleasant mouthfeel. To create the Biei Jersey Milk Coffee ($7.50++), a shot of freshly brewed ristretto shot is poured into a tall glass of ice cold Biei milk. I was somewhat apprehensive about this drink. It hit me as more of a coffee milk rather than coffee with milk. Sure, Baristart probably wants to let their milk shine. However, it also had a rather siap (astringent) aftertaste from the ristretto shot. That said, it’s unique and satiating in its own right. For instance, the full cream milk coats your mouth in a luxe layer of milk fat. Enhancing that experience is a mellow sweetness, which balances the bitter notes. 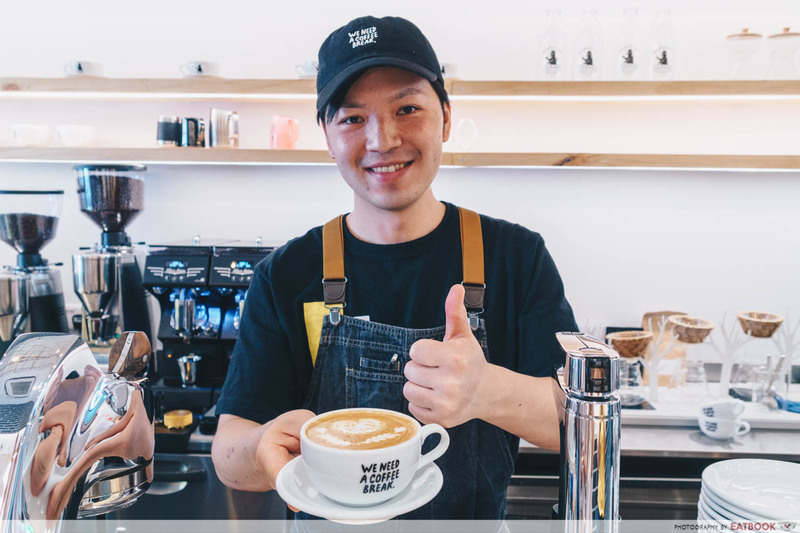 Latté art is the forté of chief barista Yuuki Takeuchi. 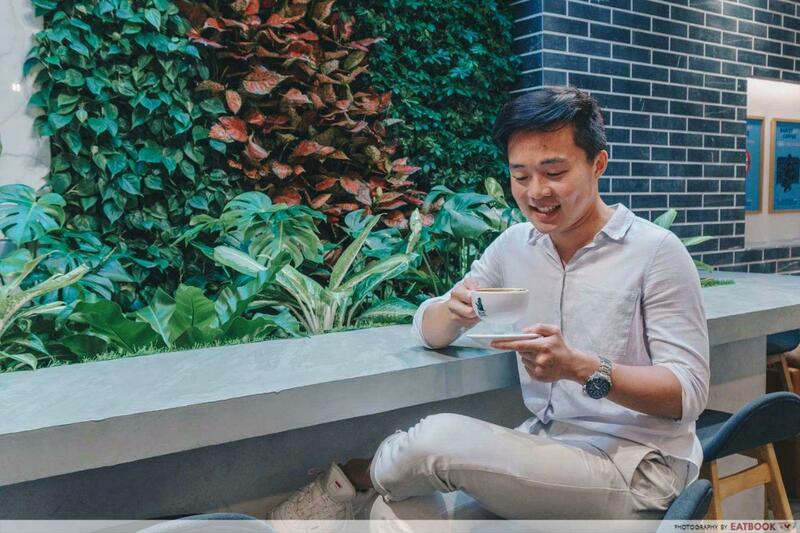 Having won many prestigious latté art competitions, he’s able to whip up any latté art request you throw at him. For me, I decided on “Eatbook”. As an armchair-expert on coffee, I enjoyed the complementing flavour nuances of the Latté ($6.70++). Chocolatey notes harmonise with the nutty body, which is accented by the roasting of coffee beans. The fragrance of warm, freshly-made caramel came to mind as I smelled it. 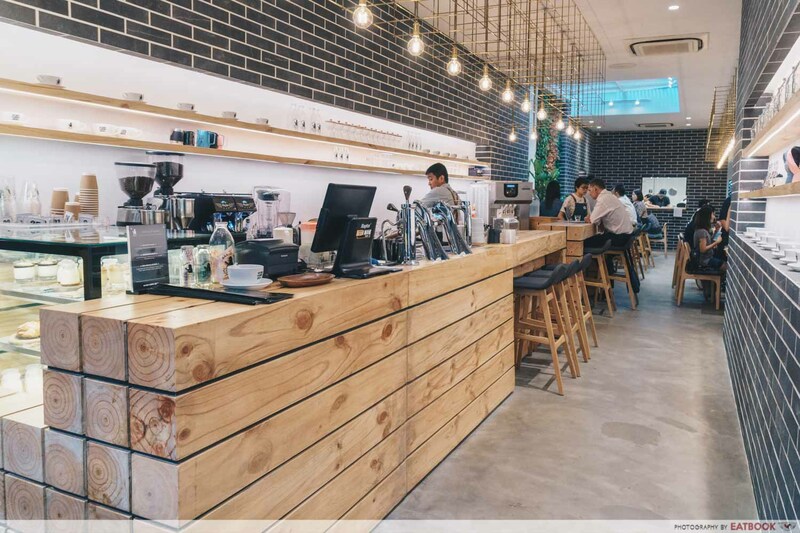 Apart from the occasional wood fixtures that impart a Japanese flare, the café comes across as just another white girl hangout spot. However, I am not complaining. I absolutely adore the brass filament bulbs hanging from the ceiling and quaint black brick tiles that give a chic barn house vibe. Complement that with the cute Japanese barista and great service, I’m sold. Smiling awkwardly at my coffee, I realised how nouveau this café is. 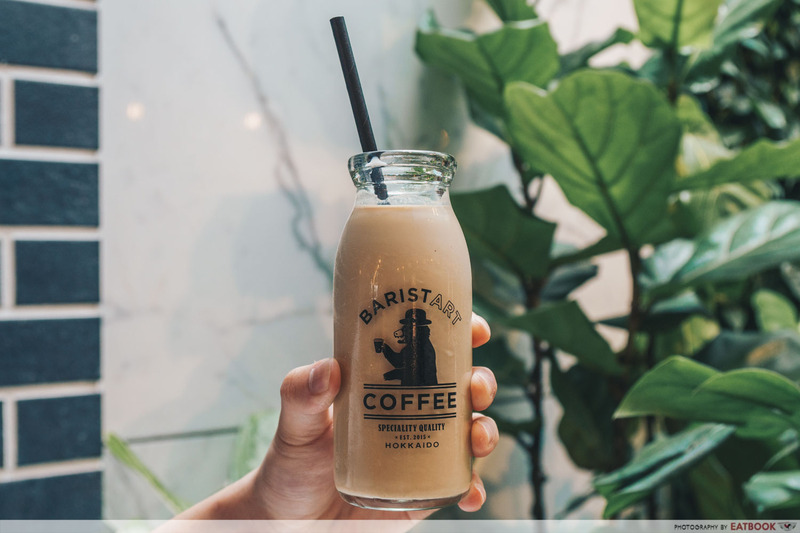 I sense a certain freshness and ambition in Baristart’s menu: you can come here for your caffeine, lunch, dinner and dessert fix. 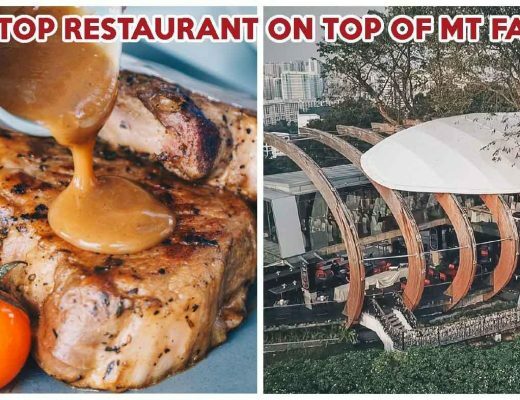 For the most part, Baristart’s line-up of food is pretty much on point. I’m just waiting to see if they can maintain these standards after their chief barista returns to Japan.